Firefighters are making progress in battling a deadly blaze that has become the most destructive wildfire in Colorado's history. NBC's Miguel Almaguer reports from the frontlines where firefighters are holding their ground. So far, two lives have been lost in the wildfire. Firefighters made some progress battling a massive, deadly wildfire near Colorado Springs late Friday when cooler temperatures, rain and calmer winds swept in, allowing them to increase containment to 30 percent. Mandatory evacuation orders for thousands of Colorado Springs residents were lifted, according to NBC station KOAA of Pueblo, Colo.
More than 38,000 people were evacuated at the peak of the blaze. The fire, the worst in the state's history, has killed two people and made ashes of 419 homes. Authorities were hopeful about being able to stem the blaze. "We had a real good day without wind in comparison to previous days," El Paso County Sheriff Terry Maketa said at a news conference Friday afternoon. "The cloud cover we got to experience and finally the rain made a tremendous impact especially with that duff that lines the ground and we've seen a lot of smoldering over the last several days. So some things finally turned in our favor ... and I think if you look at it as a fight, we got our tails kicked for a couple days." The fire raged mostly uncontrolled for days, with a burn zone covering nearly 25 square miles. One of three major fires raging in Colorado, the Black Forest fire is now the most destructive on record in the state. 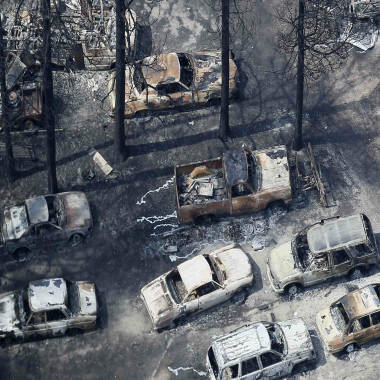 The two people killed by the fire appeared to have been planning to flee the area before the fire caught up with them, authorities said. The fire's cause will now be investigated as a possible homicide, Maketa said earlier. Drought conditions fuel blazes in the U.S. The two victims were on the phone as flames ringed their home, he said. "It appears as though the individuals were in the garage, the car doors were open as though they were loading or grabbing last minute things, and all indications are from the evidence on scene that they were planning to depart very quickly,” Maketa said. Aircraft dropping flame-retardant chemicals swooped low over the wooded residential areas as 750 firefighters on the ground tried to battle back the licking flames that threatened to encroach on the city limits of Colorado Springs. Military and National Guard personnel have joined in the fight as bone-dry conditions and whipping winds have driven the fast-moving blaze. The Waldo Canyon fire destroyed 346 homes in the Colorado Springs area last year, making it then the most destructive Colorado wildfire on record. That fire killed two people and forced about 35,000 more to be evacuated. The U.S. Air Force Academy, located immediately north of Colorado Springs, announced Friday morning that it had opened its Emergency Family Assistance control center to help area residents affected by the fire. The Black Forest fire has become the most destructive in Colorado history, devouring more than 360 homes. NBC's Miguel Almaguer reports. A separate wildfire in the state, the Royal Gorge fire, shut down the historic Royal Gorge Bridge and a surrounding amusement park, and caused the evacuation of 900 inmates from the Colorado Territorial Correctional Facility. That fire destroyed 48 structures surrounding the bridge, which stretches 950 feet above the Arkansas River and is located 15 miles from Cañon City. It had burned 3,142 acres by Friday night and was 40 percent contained, NBC station KUSA of Denver reported. The Big Meadows fire in Rocky Mountain National Park was reported to have spread over 333 acres by late Thursday, according to NBC News affiliate KUSA. That fire was in a remote area and did not threaten any residences or communities.